The legal representative dell'A.I.G. and it directs their activities according to the program established by the National Committee and the National Executive Committee; take the measures necessary for the functioning of the Association's services; coordinates the activities of the Regional Committees and the zone chairpersons. His term of office is five years and there is the possibility of re-election. The National Vice President is elected by the National Committee, he shall act for the National President in case of his absence or impediment. 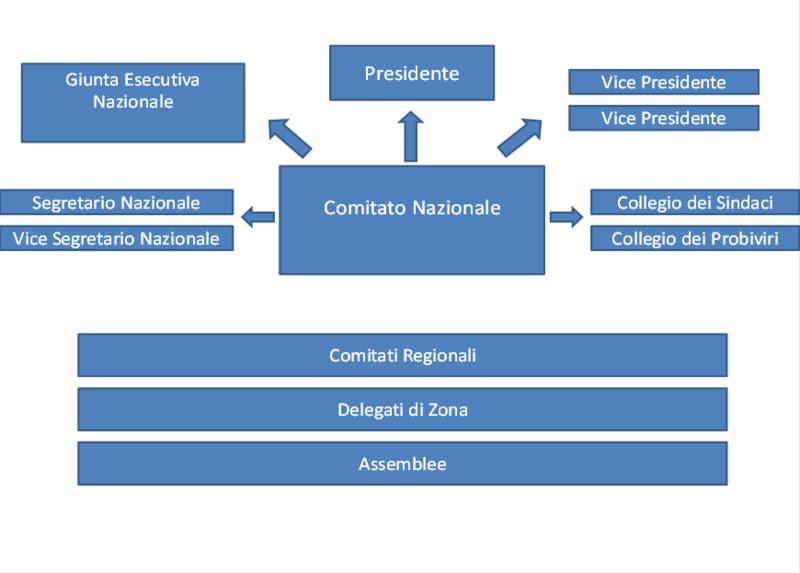 The National Committee is the highest organ of decision dell'A.I.G. and it shall exercise all the powers necessary for the pursuit of social goals. The National Executive Committee may avail itself of the assistance of a representative for each of the relevant ministries in the field of Education, Youth and Tourism. The National Secretary is appointed by the National Committee, proposed by the President, by an absolute majority. He is 'the chief of A.I.G offices and he responds to their development to the National Committee. The Deputy National Secretary is appointed by the National Committee, proposed by the President heard the National Secretary; in case of impediment replaces the National Secretary. The dell'A.I.G management control. is entrusted to a Board of Auditors consists of three regular members and two alternates appointed by the National Committee on the proposal of G.E.N. with the observance of the legal provisions and accounting standards.